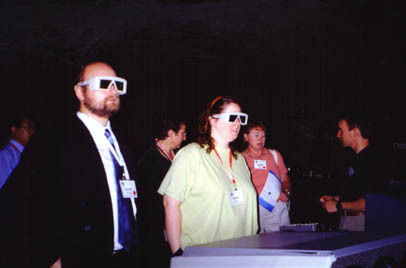 The first International Workshop on "Visual Interfaces to Digital Libraries" was held at the first ACM+IEEE Joint Conference on Digital Libraries in Roanoke, Virginia, USA, on June 28, 2001. This one-day workshop drew an international audience of 37 researchers, practitioners, and graduate students in the areas of information visualization, digital libraries, human-computer interaction, library and information science, computer science, and geography. The primary aim of the workshop was to raise the awareness of several interconnected fields of research related to the design and use of visual interfaces to digital libraries, especially in information visualization, human-computer interaction, and cognitive psychology. The workshop started with Katy B�rner's introduction and overview, followed by an invited talk from Stephen Eick of Visual Insights, entitled "Visualizing On-line Activity". Eich explained how their eBizInsights software provides a rich visual interactive workspace for analyzing user access to a given website and discovering browsing patterns. Eight papers were presented in two sessions. The topics ranged from literature visualization and spatial hypertext, to geographic information systems. Workshop attendees enjoy one of the workshop demonstrations. Time was provided for two interactive demonstration sessions. Demonstrations included one of VRCO's VGeo system and several others by workshop attendees. An expert panel discussed the future of research and development and started formulating top-ten research challenges for visual interfaces to digital libraries to help focus and guide research. In his concluding remark, Chaomei Chen outlined promising areas for future information visualization research: Visual Information Retrieval, Visual Information Exploration, Visual Information Organization, Accommodating Individual Differences, Supporting Collaborative Work, Information Visualization for Bibliometrics, Information Visualization for Scientometrics, Knowledge Tracking, Knowledge Discovery, Designing and Deploying Tangible and Meaningful Visual-Spatial Metaphors in Digital Libraries. The workshop achieved its goal of bringing people together across disciplines and stimulating interest in this multidisciplinary research. In response to the enthusiastic audience, the high-quality inputs, and many promising works in progress, we plan to hold the workshop again at the next JCDL Conference in Portland, Oregon, US, July 14 - 18, 2002. Papers, presentation slides, and other information are available from the workshop's homepage <http://vw.indiana.edu/visual01>. The workshop was sponsored by Virtual Reality Software & Consulting. Their homepage is <http://www.vrco.com>. The Distributed National Electronic Resource (DNER) for universities and colleges in the UK <http://www.jisc.ac.uk/pub99/dner_desc.html> has set ambitious targets for the development of online resources, in a way that will be co-ordinated and collaborative, but not centrally controlled. Project ANGEL (Authenticated, Networked, Guided Environment for Learning) is building essential infrastructure components to enable easier access to this wealth of learning resources. The project is led by the London School of Economics Library, in partnership with the University of Edinburgh, De Montfort University, South Bank University, Sheffield Hallam University and the EDINA data service. A tempting (but naive) approach that could have been taken to this task would have been to build "the ANGEL portal", and then waited for every university and college in Britain (...and tomorrow, the World?) to adopt and use it. However, this would simply have led to competition with leading commercial "Managed Learning Environment" products (which are being actively marketed as "primary portals" for students, and adopted as such by a number of institutions), and with the increasing number of in-house projects initiated by universities to develop their own institutional web portals (or "Interfaces To Everything", as ANGEL has broadly classified such developments). Instead, ANGEL will produce a layer of middleware services that can be used by such end-user portals to simplify and manage access by an increasingly diverse range of end-users, to an increasingly diverse range of online materials. Protocols supported by ANGEL services will range from the long-established Z39.50, to those just emerging such as SOAP (Simple Object Access Protocol <http://www.w3.org/TR/SOAP>). The ANGEL project team will collate and develop unified or hybrid metadata standards and other methods of inter-operability for resource discovery and access, bridging the gap between the two domains of 'learning' (pedagogically guided) resources, and 'library' (unguided reference) resources to create a practical implementation of standards-mapping work such as that of Dan Brickley, Mikael Nilsson et al. < http://xml.coverpages.o rg/ni2001-03-30-a.html>. The most promising descriptive standard for the former is the IMS metadata proposal <http://www.imsproject.org/>, whilst RDF (Resource Description Framework) <http://www.w3.org/RDF> is now an accepted world standard for the latter, with the potential for further extension. ANGEL will also work with what has traditionally been thought of as 'management' information about participants in Further and Higher Education, extending the eduPerson < http://www.educause.edu/eduperson/ > LDAP specification so that portals using ANGEL services can offer a high level of personalisation and personal customisation to end-users. Many of the resource collections involved restrict access to users from licence-holding institutions, and the number of licensed, income-earning, access-protected resource collections is certain to increase as more opportunities to exploit a market in learning materials are discovered by commercial players (old and new), and by education institutions under increasing pressure from government to replace subsidies with other revenue sources. The UK JISC (Joint Information Systems Committee) <http://www.jisc.ac.uk>, which is the main funder of Project ANGEL, has recognised this impending problem, and tasked ANGEL to deliver a working implementation of its Sparta specification < http://www.jisc.ac.uk/pu b00/sparta_disc.html> - a national access management infrastructure which will eventually replace the currently successful Athens <http://www.athens.ac.uk/> service. The Sparta implementation is likely to be based on the model developed by RedIRIS for PAPI < http://www.rediris.es/ap p/papi/index.en.html>, with the aim of also being inter-operable with resource vendors who adopt the Internet2 Shibboleth < http://middleware.interne t2.edu/shibboleth/> system. One particular problem that ANGEL faces is the speed of development and lack of coordination of all the commercial and public-sector initiatives that are exploiting these fields. We have dedicated project staff time to actively maintaining a technology-watch on standards and developments in the areas of Learning Resource Metadata, Education User Metadata, Authentication and Resource Access Authorisation. Of course, this is a problem shared with many fellow researchers so, rather than keeping this information to ourselves, in the spirit of Open Source development we will maintain it on the public side of our website and as a RSS news-feed. We would also appreciate email contact from those involved in relevant developments that we haven't yet found and listed. Full information about Project ANGEL, including our Technology-watch updates is published at <http://www.angel.ac.uk>. The City of Los Angeles has placed just over 600,000 images on the Internet. The 75 megapixel images are indexed using the City GIS (Geographic Information System). The images were scanned from 35 mm film at an optical resolution of 10,000 by 7,500 pixels. The project is scanning approximately 7,000 images per day and plans to reach the goal soon of putting 800,000 to 1,000,000 images on the Internet. In the scanning process, automatic index conversion is done using the existing integral metadata record in the aperture cards that hold the images. Most images are scanned at 1 bit per pixel, but the scanning system supports 8 bits per pixel and, in next month's planned ease-of-use site update, the storage and display system will support 24 and 36 bits per pixel as well as multispectral imaging. The system has an extensive relational database that can be used in conjunction with the GIS system of over 250 layers of vector information for over 900,000 parcels to locate the images. The images are of City maps and blueprints of the existing infrastructure. Examples of layers of GIS information include: Graffiti Zones, Geologic Faults (Earthquake Faults), Hillside Grading (Landslide and Mudslide areas), High Potential Methane, High Wind Area, Liquifaction/Subsidence, Potential Methane, Fire Brush Clearance, Street Resurfacing, Flood Plains, Storm Pipes (Drains), Storm Drain Inlets, and Truck Routes (High and Heavy Loads). There is a more detailed description at <http://www.ArchiveBuilders.com/whitepapers/22031p.pdf>. Archival and disaster availability issues are addressed at <http://www.ArchiveBuilders.com/whitepapers/22025p.pdf>. While the City GIS and the 600,000 images it indexes have evolved over time, and will continue to evolve, very substantial recent additions in both content and syndetic structure, as well as an expansion of the materials available on the Internet, establish a new qualitative level that provides a substantially complete expression of its final form. The City of Los Angeles GIS (Geographic Information System) is a highly integrated set of spatial (geographic) indices, including a composite and digitally rectified (the pixels are in the right place) digital orthophoto <http://mapping.USGS.gov/www/ndop> to represent images of things (such as buildings) in their true location. (The City is using a specially flown and processed image rather than the USGS image.) (City image: 50 gigapixel 8 bit image, 316,000 by 474,000 pixels optical resolution, irregular border, 6 inch pixels, 468 square miles, 2 foot contour lines, virtual reality pan and zoom). Like other forms of indexing, geographic indexing can be combined with other indices. For example, one might ask for all books of fiction that were written in the twentieth century, with stories that take place in upstate New York in the nineteenth century. USC has a project on the Internet in which archival records are indexed geographically: <http://www.USC.edu/isd/locations/cst/IDA/prospectus.html>. The website <http://navigatela.lacity.org/> gives everyone a chance to try out a fully developed spatial index. This index could be easily integrated with the USC project. For example, both systems use the same <http://www.ESRI.com> (Earth Sciences and Resources Institute 'esz-ree') software and cover approximately the same geographic area. Linking the two would be something like cataloging books by looking up the Library of Congress classification (that is, easy and deterministic, yielding the same results for almost anyone doing the process). Unlike traditional library cataloging, spatial indexing receives funding from sources such as real estate, civil engineering, environmental planning, disaster planning, and tax collection. Spatial indexing provides a method of synergistically extending the benefits of indexing expenditures, provided by various business activities, into other areas such as the humanities. The system catalog links extensive background information with interactive updates, creating a real-time library that can respond effectively to the information needs of emergency personnel, businesses, and the public during and after earthquakes, mudslides, floods, fires, and other urgent occurrences. Interactive redlining of stored documents and the GIS-based index allows field workers to input data, via the Internet, creating maps, descriptions, and catalogs of field incidents, events, and situation status that can be displayed on the Internet. Though not currently linked to the GIS system, similar real-time maps can be found at <http://www.lainsider.com/autos/traffic/latraffic.html?//x>, at <http://trafficinfo.lacity.org>, at <http://trafficinfo.lacity.org/html/4303880606.html> and at <http://www.scecdc.scec.org/recenteqs/Maps/Los_Angeles.html>. Because these maps are updated automatically, the maps respond to events in under one minute. The websites presented are: Internet GIS indexed documents and digital orthophoto: <http://NavigateLA.LACity.org> and interactive Internet permitting and plancheck redlining: <http://Eng.LACity.org/demos>. There is a planned ease-of-use site update in the next month, so if you have any problems, please try back in a few weeks. The City of Los Angeles has a monthly meeting to coordinate GIS and document management plans. If you would like to get the meeting announcements, topics, websites presented, and meeting recaps via email, please send your email address to <SteveGilheany@ArchiveBuilders.com>. Eric F. Van de Velde, PhD. CAV2001 is the conference proceedings of the Fourth International Symposium on Cavitation. This repository contains 110 scholarly papers. CaltechCSTR is a repository of technical reports of the Caltech Computer Science option. The repository currently contains 237 reports, but this is an ongoing effort, and we expect to continue adding reports as they become available. Both OAI-registered repositories can be found at <http://library.caltech.edu/digital>. Educated various library staff in a variety of electronic-publication skills. Identified faculty, options, and research groups willing to be pioneers in freeing the research literature. In addition to the two repositories just registered, we are currently preparing technical-report repositories for several other options. We are also well under way to make available our first batch of Electronic Theses. INSPIRAL (INveStigating Portals for Information Resources And Learning, (http://inspiral.cdlr.strath.ac.uk) is a six-month JISC / DNER funded project running from 1 May to 31 October 2001 to investigate the issues surrounding the linking of virtual learning environments (VLEs) / managed learning environments (MLEs) and digital libraries. The research is being carried out in collaboration with the Centre for Digital Library Research (http://cdlr.strath.ac.uk) and the Centre for Educational Systems (http://www.strath.ac.uk/ces/). INSPIRAL's focus is on institutional and end-user perspectives, with the aim of identifying priority areas for future JISC strategic planning and investment within the higher and further education sectors. INSPIRAL events are an integral part of the final analysis and consist of three half-day forums and two full-day workshops to be held at locations around the United Kingdom. On June 12, 2001, INSPIRAL held its first forum at the University of Strathclyde in Glasgow. A specific aim of the forum was to discuss, identify, and gather information on the problems and barriers to successful linkage of VLEs / MLEs and digital libraries. The topics discussed gave particular attention to the considerations of the learner and the institution. Attendees represented institutional departments that are likely to be involved with VLE / MLE and digital library linkage, providing library, academic, and technical perspectives in the identification of barriers, problem areas, and possible solutions. The forum began with a presentation by Sarah Currier (INSPIRAL Research Fellow) who gave an overview and update of INSPIRAL's research to date. Participants were then invited to introduce their own and their institution's involvement in VLEs / MLEs and digital library integration. These discussions provided important information on the current situation in various institutions around Scotland, including Caledonian, Edinburgh, Stirling and Strathclyde universities, regarding linkage, as well as identifying some of the more specific problems and barriers to linkage at the institutional level. The forum continued with group and general discussions on the chosen topic and also identified ideal situations that could solve the barriers to linking VLEs / MLEs and digital libraries within the higher and further education sectors. Issues raised at this forum have already proved valuable to INSPIRAL's research objectives, and have indicated three areas that require further and more detailed investigation, namely institutional, technological and social levels, within the teaching and learning environment. A full report on these findings is included on the INSPIRAL web site at <http://inspiral.cdlr.strath.ac.uk/documents/forumrep1.html>. The UK Collection Description Focus launched on 1 June 2001 (http://www.ukoln.ac.uk/cd-focus/) is a national post, jointly funded for a twelve-month period by the Joint Information Systems Committee/Distributed National Electronic Resource (JISC/DNER), the Research Support Libraries Program (RSLP) and the British Library. The Focus aims to improve co-ordination of work on collection description methods, schemas and tools, with the goal of ensuring consistency and compatibility of approaches across projects, disciplines, institutions and sectors. The Focus intends to provide support both for UK projects actively involved in collection description work and for those investigating or planning such work. The Focus is located within UKOLN, (The UK Office for Library and Information Networking) which is based at the University of Bath. The Focus will be run jointly by Pete Johnston and Bridget Robinson with support from their partners in the CD Focus initiative, the Archives Hub and the mda. The Focus will be informed by work carried out by other members of UKOLN, including the work of Andy Powell on the RSLP CLD schema, and the broader work on the effective exchange and reuse of information resources carried out by Paul Miller as Interoperability Focus. The Focus will also liase with the Collection Description Working Group within the Dublin Core Metadata Initiative. The Focus will look into the development of simple tools to facilitate the creation and management of collection descriptions including: tools to support transformations between different collection description schemas; enhancements to data creation interfaces; the use of a schema registry to publish and share CD schemas; and mechanisms for "harvesting" distributed descriptions. The CD Focus team will draft a questionnaire that will be sent out to relevant projects and stakeholders within the UK. The questionnaire will be used to gather information on project activity, standards and metadata schema adopted, implementation issues, software in use and areas where guidance is needed. The data gathered will inform subsequent visits, briefing papers, event agendas and other Focus activities. Three regional workshops will be held during the project. There will also be two briefing days. The first one will be held in the autumn and then a second briefing day will be held at the end of the project. The CD Focus website can be found at <http://www.ukoln.ac.uk/cd-focus>. The UK Data Archive has recently released a number of major datasets that are available for browsing, exploring and downloading via a suite of Internet-based tools, known as NESSTAR. Many government departments, research institutes, companies, and other kinds of organisations collect social and economic data. Many of these data are available for re-use, particularly for research and education, typically via data archives and libraries. The UK Data Archive is a specialist national resource containing the largest collection of accessible computer readable data in the social sciences and humanities in the United Kingdom. The full UKDA catalogue can be searched at: <http://www.data-archive.ac.uk/findingData/ourDataHoldings.asp>. together with some other individual popular UK-based datasets such as the Scottish Social Attitudes Survey. This online service will be extended to other data collections within the UKDA on a continuous basis, with more datasets being mounted on the system over the coming months. Who can access these data? Anyone can search for and view full information about the survey and the data (metadata in the form of a catalogue record and codebook in XML). Non-commercial users registered with UK Data Archive can also explore, analyse and download the data. If you are interested in becoming a registered user, please see the UKDA Web pages at: <http://www.data-archive.ac.uk/orderingData/introduction.asp>. NESSTAR is a set of internet-based tools providing an enhanced online service for data providers and data users, that gives easier and quicker access to data and information about that data. A common scenario for a user of a data archive is identification of a dataset of possible interest through an Archive's online catalogue, through which the user can also read about the survey design and contents, and possibly view the codebook and associated user guides. However, at this stage the user does not usually have immediate access to the data or to any frequencies or percentages. She may then need to contact the archive to ascertain its suitability, order the data and then wait to receive it, for example on a CD. NESSTAR radically facilitates the data access process, allowing users immediate access to frequencies and percentages and allowing registered users to perform exploratory online analyses (at no cost) and then download the data for offline analysis immediately. The three screen shots below show that from browsing the metadata at the variable level (i.e., the questions asked in a survey) a user can quickly carry out a basic tabulation and then display this as a graph with only 4 clicks of a mouse. The table can be added to an existing list of favourites or bookmarks in the user's Web Browser, where the user can refer to it later or mail it to a colleague. Screenshots from NESSTAR. Copyright 2001 UKDA. Used with permission. The NESSTAR project was funded by the European Commission to the sum of �2 million under the 4th and 5th Framework IT Programmes. The three main partners collaborating in this innovative R&D project have been the UK Data Archive, the Norwegian Social Science Data Services (NSD), and the Danish Data Archive (DDA). NESSTAR Explorer also provides the option of simultaneous access to catalogues from the Danish and Norwegian data archives. It is planned that catalogues from other data archives will be available in the near future. Finally, NESSTAR is also being used by other data communities as a powerful Intranet service for accessing their own data sources. Further instructions on using NESSTAR to access datasets at the UK Data Archive can be found at: <http://www.data-archive.ac.uk/usingData/nesstar.asp>, and there is an online guide to using NESSTAR light at <http://www.nesstar.org/light/userguide/1-1.asp>. More about the R&D and technical developments of NESSTAR may be found at: <http://www.nesstar.org>. Specific enquiries are handled by the User Support team at <archive-userservices@essex.ac.uk>. Bethesda, Md., USA � (June 29, 2001) During the ALA 2001 Annual Convention, NISO, the National Standards Information Organization and BASIC, the Book and Serial Industry Communications, jointly presented a forum on the challenges of integrating electronic journals into library collections and the standards now in development that will enable publishers and librarians to deliver better access and more information about these resources. These presentations are now available on the NISO web site at <http://www.niso.org/Ejournal-web.html>. In a presentation entitled "Rights & Content: Full Text Databases", Deborah Loeding, VP Sales & Marketing for the H.W. Wilson Company provided an overview and introduction to the challenges and opportunities that electronic journals bring by allowing us to connect to content and a variety of supporting information about that content. The presentation by Brian Green, Managing Agent BIC/EDItEUR (Book Industry Communication) entitled "Developments in Metatdata: ONIX for Serials" reported on Onix for serials, an international standard for communicating a variety of metadata elements including comprehensive product description and bibliographic detail, reviews, author biographies, extracts pricing and availability in different markets and more as it relates to e-serials. Eric Van de Velde, Director of Library Information Technology, California Institute of Technology and Chair of NISO's OpenURL Standards Committee, explained how the OpenURL can connect information seekers to the appropriate copy of any chosen resource by passing along bibliographic or descriptive information about the resource in his presentation "Developments in Linking: OpenURL". NISO is the only U.S. group accredited by the American National Standards Institute to develop and promote technical standards for use in information delivery services providing voluntary standards for libraries, publishers and related information technology organizations. All NISO standards are developed by consensus under the guidance of experts and practitioners in the field to meet the needs of both the information user and the producer. For information about NISO's current standardization interests and membership possibilities, please visit the NISO website at <http://www.niso.org>. For additional information contact NISO Headquarters at (301) 654-2512. Email: <nisohq@niso.org>. Special Projects Associate Council on Library and Information Services Washington, DC USA. Pioneers who once experimented with solitary digital-access projects at the campus library's periphery are increasingly building systems for managing online information at its core. Increasing chunks of library budgets are spent on digitizing collections, acquiring such computer-accessible research materials as e-journals, and maintaining online public access catalogs. Moreover, campus librarians are applying electronic-information technologies to the management of their holdings in all formats -- books, manuscripts, and other traditional materials as well as digital collections. And by relating rather than separating traditional and electronic resources, they are developing more efficient and economical services for students and faculty. More on such changes is available in a report from the latest forum of the Digital Library Federation (DLF) at <http://www.clir.org/pubs/issues/issues22.html#digital>. Increasingly the Web is full of material of value for higher education and research that can be accessed for free. Why shouldn't campus libraries pull it into their own digital collections for use by scholars and students? No reason not to -- but don't imagine that there won't be costs. For one thing, staff investment is needed in identifying, evaluating, and selecting Web material of real worth for study. Origin, site integrity, ease of navigation, and rights restrictions also must be considered, and investments must be made in cataloging, data management, and search functions. How libraries can recognize and deal with the problems and opportunities in using "free" Web resources is explained in a new publication from the Digital Library Federation and the Council on Library and Information Resources, Building Sustainable Collections of Free Third-Party Web Resources, is available in print and at <http://www.clir.org/pubs/reports/pub98/pub98.pdf>. Will all the scholarly journals now published electronically stay accessible electronically over time? Can the property rights of publishers, the long-term access responsibilities of libraries, and the reliability assurances that scholars need be reconciled in agreements to create archives of electronic journals? Seven major research libraries -- Cornell, Harvard, MIT, Penn, Stanford, Yale, and the New York Public -- have received grants from the Mellon Foundation to find out. The Digital Library Federation, which helped develop the program, is tracking progress at <http://www.clir.org/diglib/preserve/presjour.htm>. Building in part on work on imaging practices conducted with the Research Libraries Group (RLG), the Digital Library Federation is investigating methods for evaluating the quality of digital images. Such methods will help assess claims that are made about images by their producers or vendors. A report from a meeting convened to identify standard criteria for assessing the quality of digital images and digital imaging systems is available at <http://www.clir.org/diglib/standards.htm>. The DLF has initiated a process to identify standard structural, administrative, and technical metadata needed for the successful, consistent, and interoperable management of digital objects. The process builds upon and extends the work of the Making of America II project, which developed a documented set of metadata elements for a limited range of digital objects. The draft scheme is available from <http://www.clir.org/diglib/standards/mets.xsd>. A report on the meeting is at <http://www.clir.org/diglib/standards/metssum.pdf>. Universities are investing heavily in digitization to make information from and about their library collections available to scholars and students by Internet. But the limitations of commercial search engines, and the uneven quality of what they turn up, often make it difficult for researchers to find all the important material that's pertinent to their projects. The Digital Library Federation (DLF) is working with the Open Archives Initiative to make possible Internet gateway services through which scholars can find more material more readily in their specialties: <http://www.clir.org/diglib/architectures.htm>. Everyone knows that digital technologies are enabling scholars and students to find, evaluate, and use information in new ways, but what are they? A concerted effort to find out has been called for by a group of college and university library directors convened by the Council on Library and Information Resources (CLIR) and the Digital Library Federation (DLF) to scrutinize changing patterns in the operations and use of campus libraries. The proposed study would cover all resources, not just those of libraries, consulted by students and faculty when they need information. For more information please see the May/June 2001 issue of CLIR's newsletter, CLIR Issues, in print or at <http://www.clir.org/pubs/issues/issues21.html>. While not directly related to digital libraries, two additional new books just published by the Council on Library and Information Resources will be useful to librarians: Folk Heritage Collections in Crisis, a report on a conference and a survey, and A Collaborative Approach to Collection Storage: The Five-College Library Depository, may be purchased in print through CLIR's Web site, <http://www.clir.org>, or located online through <http://www.clir.org/pubs/reports/reports.html>. The University of Maryland, College Park, and Films for the Humanities & Sciences, Inc., (FFH&S) of Princeton, NJ, signed a far reaching agreement earlier this month (June 6, 2001) enabling the campus libraries to distribute approximately 1,000 selected titles from the FFH&S collection of educational videos over the university's state-of-the-art digital video-on-demand delivery system. Signing the agreement at a ceremony held in the new Performing Arts Library at the Clarice Smith Center for the Performing Arts were Charles Lowry, Dean of Libraries at the University of Maryland, and Betsy Sherer, President and CEO of FFH&S. Commenting on the significance of the agreement at the signing, Dean Lowry said: "Since I installed my first mainframe library system 20 years ago, we have been talking about how to build digital or virtual libraries. In that time the world of information technology has been transformed. As I look around the landscape of academic and research libraries today, I find that they too have been transformed. With the opportunity presented by our partnership with FFH&S, we take a giant step in 'multi-mediation' and the use of digitized audio and full motion video which is an integral part of our sense of content for teaching and research." In her remarks, FFH&S's Sherer said: "This is an age in which education's needs are increasingly diverse and specialized. Films for the Humanities & Sciences will continue to seek ways to provide quality programs in formats that are compatible with new learning environments. We are pleased and proud to participate with the University of Maryland in this pioneering and exciting effort." What this agreement means, according to Allan C. Rough, Manager of the University's Nonprint Media Services Department, is that students and faculty will soon be able to access a wide variety of video programming, much of it in the performing arts area, from almost any location on campus. This includes libraries, classrooms, offices and dormitory rooms. Rough explained that the goal is to allow users to instantly access a program directly from the Libraries' online catalog. He added: "Digital video-on-demand systems have been a reality for a number of years, but copyright and intellectual property constraints have made most academic institutions reluctant to purchase expensive video server technologies. Universities were faced with a classic dilemma: if we purchase a server, will we be able to find video programming we can legally put on the system? This agreement answers that question with a resounding �yes'!" Carleton Jackson, Nonprint Media Reference Librarian, noted that "until recently, universities were divided by buildings and campuses; collections were segregated by subject, discipline, format and walls. This agreement breaks down those walls to unleash the full potential of sound and image for teaching." A Primedia company, Films for the Humanities & Sciences is the leader in distributing high quality video and multimedia programs to colleges, schools and libraries. Their collection of more than 9,000 titles represents the best from the most prestigious producers from around the world, including the BBC, ABC News, the Discovery Channel, and many others. This agreement with the University of Maryland Libraries marks their first collaboration with a Higher Education institution. With many of the 1,000 selected titles related to theatre, dance and music, a sampling of the collection includes the following: "Shakespeare's Plays", performed by the Royal Shakespeare Company; "Glenn Gould on Gould"; "Georg Solti; Making of a Maestro"; "Edward Elgar: Hope & Glory"; "Art of Conducting" series; "Empire of Dreams: Bolshoi Ballet"; and "Great Arias" series. Bruce Wilson, Head of the Performing Arts Library, said that "thanks to this agreement, we now have access to some of the most relevant and exciting programming to go with one of the most technologically advanced Performing Arts libraries in the country." The FFH&S collection of documentaries secured by the UM Libraries also contains a number of titles related to world history, literature, education, computer science, art, communications, science, business, etc. The University of Maryland Libraries expect to launch a pilot project in the fall, enabling users to access a limited number of titles in the collection, according to Jeff Bridgers, Head of Digital Libraries. June 22, 2001, Library of Congress, Washington, DC: The Library of Congress and Alexa Internet announce the Election 2000 Collection, the first large-scale collection of date-searchable Web sites to be archived and made available online. The Election 2000 Collection <http://www.archive.alexa.com/collections/e2k.html> developed for the Library of Congress by the Internet Archive, Alexa Internet, and Compaq Computer, is an Internet library containing archived copies of more than 1,000 election-related Web sites. The collection, searchable by date, by Web site, and by category via Alexa's new "Wayback Machine" technology, contains more than 2 million megabytes of election-related information gathered between August 1, 2000, and January 14, 2001, including what was published on the candidates' Web sites, political party sites and major news sites. The Election 2000 Collection is important because it contributes to the historical record of the U.S. presidential election, capturing information that could otherwise have been lost. With the growing role of the Web as an influential medium, records of historical events such as the U.S. presidential election could be considered incomplete without materials that were "born digital" and never printed on paper. Because Internet content changes at a very rapid pace, especially on those sites related to an election, many important election sites have already disappeared from the Web. For the Election 2000 Collection, rapidly changing sites were archived daily, or even twice and three times in a day, in an attempt to capture the dynamic nature of Internet content. "This was the first presidential election in which the Web played an important role, and there would have been a gap in the historical record of this period without a collection such as this," said Winston Tabb, Associate Librarian for Library Services of the Library of Congress. "The Library of Congress worked with the Internet Archive, a nonprofit organization dedicated to building digital libraries, to create this digital collection for researchers, historians and the general public." Compaq Computer undertook the major task of collecting and archiving sites for the collection. "Compaq Research was able to "deep crawl" hundreds of Web sites each day to build an unprecedented record of the changing nature of the Web. It was tricky, because finding all the images, videos and computer scripts associated with each page required developing specialized technology," said Brewster Kahle, President of Alexa Internet. Alexa Internet created Wayback Machine technology, which allows users to browse this huge collection and other Internet libraries like it. "By enabling users to retrieve Web sites out of the past, Alexa's Wayback Machine technology adds a time dimension to the Internet and creates the first 'time browser' for the Web," said Mr. Kahle. The Library of Congress's mission is to make its resources available and useful to Congress and the American people and to sustain and preserve a universal collection of knowledge and creativity for future generations. Founded in 1800 to serve the reference needs of Congress, the Library of Congress is the world's largest library, containing nearly 121 million items in all formats on which information is recorded. It serves Congress and all Americans through its 21 reading rooms on Capitol Hill as well as through its popular Web site at <http://www.loc.gov>. Alexa Internet, the Web Information Company, gathers, stores, indexes and makes available multi-terabyte digital libraries, collections of Web sites and other Internet information. The company's Archive of the Web has been growing since 1996, and now contains more than 40 terabytes of data. Alexa also offers a free Web navigation service (available at <http://www.alexa.com>), which gives Internet users access to the Archive as they surf, as well as detailed information about Web sites such as related links, contact information, site statistics and reviews. The company donates a copy of its Archive of the Web on a continuing basis to the nonprofit Internet Archive, which is endowed to preserve the digital heritage for scholarly access. Alexa, a wholly owned subsidiary of Amazon.com, is located on the Web at <http://www.alexa.com>. The Internet Archive (<http://www.archive.org>) is a 501(c)(3) public nonprofit organization that was founded to build an "Internet library," with the purpose of offering permanent access for researchers, historians and scholars to historical collections that exist in digital format. Founded in 1996 and located in the Presidio of San Francisco, the Archive has been receiving data donations from Alexa Internet and others. British Library, June 13, 2001: "This week the British Library launches New Strategic Directions, which outlines our plans for the next five to seven years. The responses of staff, readers, customers, visitors and all those who use library services in the UK will be sampled to give us an insight into the balance of opinion among our user and stakeholder groups. There is a survey at the Library's website www.bl.uk, which we hope that our users (and potential users) will complete. All respondents will be entered in a draw to win �20 Amazon vouchers to spend on books and music." "The consultation survey is being widely promoted into all UK libraries by mail-shots, posters, information leaflets and e-mails to users. There will be a PC dedicated to the web survey in the Front Hall of our London building and PCs for access in the Reading Room at Boston Spa in Yorkshire." "One of the Library's core values is that access to knowledge and information empowers and enriches people. From that belief comes the Library's vision of 'making accessible the world's intellectual, scientific and cultural heritage. The collections of the BL and other great collections will be accessible on everyone's virtual bookshelf- at work, at school, at college, at home.'" "In order to realise the vision, the Library will concentrate on understanding the changing needs of users, creating opportunities to work in partnership with other libraries, and bringing the Web centre stage in our activities." Access strategy: making the collections more accessible to a wider audience, reshaping services where there are alternative sources of supply, and contributing to making library provision more effective in the UK." "The text of New Strategic Directions and the survey are available on the Library's website www.bl.uk. Users and stakeholders without their own PC can use one of the Open Access PCs in the Library's main buildings to complete the survey. If you would prefer print copies of either document, please email <survey@bl.uk>. "If you have further questions about New Strategic Directions, please e-mail <ann.clarke@bl.uk> or <jonathan.purday@bl.uk>. " The British Library, 2 July 2001: "The British Library has appointed its first e-Director as part of a wider restructuring of its top tier of management." "The appointment of Dr Herbert Van de Sompel as Director of e-Strategy and Programmes was announced today and he will join the Library on 1 September 2001 completing the BL's new streamlined senior management team." "Charged with extending access to resources, both for customers and members of the public, the team will implement strategy across a broad range of activities of the UK's national library. The post of e-Director in particular will be central in taking forward the British Library's vision of a digital future for its collections and services." "'Our e-Strategy will be at the core of the Library's work and will underpin many of our priority developments,' said the British Library's Chief Executive, Lynne Brindley. 'As Director of e-Strategy and programmes, Herbert will be the driving force behind the development of the British Library's e-strategy, pushing forward the role of electronic media and services in providing public access, opening up collections, creating productive partnerships with the library and scholarly network and developing new enterprises.'" "Lynne Brindley continued, 'Herbert Van de Sompel brings an international reputation in the digital library field, a deep understanding of what is technically possible, combined with a real sense of service mission. With his European and North American links he will ensure that the British Library plays a leading role internationally in creating our digital future.'" "Dr Van de Sompel joins the Library having spent the past year as Visiting Professor of Computer Science at Cornell University. For 17 years he was head of the library automation department at the University of Ghent, Belgium where he led an ambitious programme to create an outstanding electronic library and planned and implemented a range of innovative services." "More recently he worked at the renowned Research Library at the Los Alamos National Laboratory, on a PhD focusing on open reference linking (OpenURL and SFX) and the Open Archives Initiative. The Ph.D. was awarded in Spring 2000, following examination by two key figures in digital library developments: William Y. Arms (Professor of Computer Science at Cornell University) and Clifford Lynch (Director of the Coalition for Networked Information, USA)." "Dr Van de Sompel's work has received much recognition in both the digital library community and in the academic world. He has also acted as a consultant to many key information industry companies on strategy and on the conceptualisation or evaluation of new digital services." "As e-Director he will lead the BL's transformation to an e-centric organisation, pulling together historically discrete and disparate programmes, acting as champion and advocate for e-strategy and leading an integrated Digital Library development programme. Major transformational developments to be supervised and driven forward by the e-Director include the digitisation of many of the Library's collections as well as the archiving of materials that are 'born digital'. Working in close collaboration with the rest of the executive team, Dr Van de Sompel will ensure the implementation of a fully integrated e-programme across all Directorates � adding the essential e-ingredient to the British Library's strategies for progress." "Commenting on his appointment, Dr Van de Sompel said: 'Research libraries around the world are trying to define their identity in the digital domain. With its recently released New Strategic Directions document, the British Library has made a clear statement regarding the e-position it wants to be in; I am very excited about being able to play a role in the genuinely challenging process of getting there. Currently, www.bl.uk welcomes users to the website of the British Library. A few years from now, the same URL should welcome them to the whole British Library.'" "Offering Dr Van de Sompel warm congratulations on his appointment, Lynne Brindley added, 'This new role represents a more coherent and strategic approach towards the various strands of activity that comprise the British Library's programme of digitisation. It will also lead the way in the development of the Library's wider e-strategy. The e-Director will oversee the transformational changes to the Library's culture and working practices that are necessary in order for us to fully embrace the digital and wider e- revolution � adapting our collections and services to remain at the leading edge of research and reference worldwide.'" "For further information, please contact Ben Sanderson at the British Library Press Office on 01937 546126, or email <ben.sanderson@bl.ukp>." "DUBLIN, Ohio, June 19, 2001--The OCLC Users Council unanimously ratified changes to the OCLC Articles of Incorporation and Code of Regulations recommended by the OCLC Board of Trustees following a year-long study of strategic directions and governance." "Under new bylaws adopted May 21, Users Council changed its name to Members Council and added six new delegates from outside the United States to better define its role in strategic planning and extend global representation." "Action came May 20-22 during the third and final meeting of the 2000/01 Users Council with the dual themes of 'The Library as a Virtual Place' and 'OCLC Strategic Directions and Governance Study.'" "The OCLC Board of Trustees retained the Arthur D. Little consulting firm in January 2000 to conduct an independent study of OCLC's strategic directions and related issues of governance. An advisory council of distinguished librarians and other leaders in the information professions and academe interacted with the consultant and prepared recommendations. The Users Council spent a great deal of time during its 2000/01 meetings discussing these issues before the May vote." "In addition to changing its name, council bylaws were amended to read that the 'Members Council shall advise the Board of Trustees and OCLC management of emerging, critical issues that require OCLC tracking, planning, or other responses so that OCLC's own strategic planning is informed by this input.'" "Council voted to add delegates from the Netherlands, Japan, South Africa, France, Mexico and China to serve for the next three years while a group of representatives from council, the Board of Trustees, regional networks and service centers continue work on a new algorithm to help define new standards for membership and council representation..."
For the full press release, see <http://www.oclc.org/oclc/press/20010615a.shtm>. "June 16, 2001 - Inwood, WV. TLC/CARL � a leader in library automation and personalized web portal services announced today that the company�s state-of-the-art interlibrary loan toolkit has been selected by Ex Libris." "The TLC software, named Library�Connect, is a middleware solution that powers ILL management functions. The product allows developers to build ISO standard ILL applications on heterogeneous platforms with hardware, operating system, network and protocol level independence. Library�Connect enables the fast and efficient development and deployment of ILL management, document delivery and resource sharing applications." "The Ex Libris group is a leading worldwide supplier of software solutions and related services for libraries and information centers. The company is known for using advanced technologies and innovative programming techniques to create a system that accommodates any language, script and directionality. Ex Libris� approach is flexible, scalable and based on open standards -- making it extensible to other systems." "Users of TLC�s ILL toolkit range from major libraries to other automation vendors, notably The National Library of Medicine, The National Library of Canada, CISTI, and Mankato State University (MNSUC-PALS), and automation vendors Pigasus and RLG." For the full press release, see <http://www.exlibris-usa.com/news1.asp?categoryId=118&admin>. "June 16, 2001 - Los Angeles, CA: Infotrieve, a global leader in commercial document delivery, today announced an arrangement with Ex Libris Inc. to provide access to Infotrieve's document delivery services through links from Ex Libris' SFX context-sensitive linking software. As Infotrieve's newest Platinum-level service partner, SFX users can request articles directly from Infotrieve's pay-per-view, complete-text delivery service." "SFX permits context-sensitive linking within a library's entire electronic collection, providing seamless integration of heterogeneous resources for management by the librarian. The librarian defines the conceptual relationships between different information resources to enable users to fully exploit the collection and link to appropriate services, such as Infotrieve." "Templates for creating links between SFX and Infotrieve are included with the SFX server software, making it easy for librarians to offer Infotrieve document delivery services across a wide range of the library's resources. These Infotrieve links can be selectively provided when an article is not available from the library's collection, for delivery either in electronic or print formats." For the full press release, see <http://www.exlibris-usa.com/news1.asp?categoryId=115&admin>.